Karl Keating answers questions about his new book of questions and the most difficult and strange questions he’s ever been asked as an apologist. Karl Keating is founder and senior fellow at Catholic Answers, one of the nation’s largest lay-run apostolates of Catholic apologetics and evangelization. Keating, a lawyer, founded Catholics Answers in 1979 in response to fundamentalist literature left on cars at a parish in San Diego. 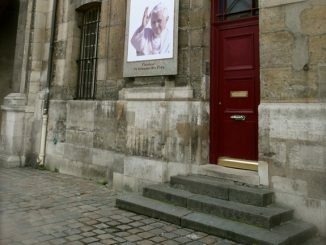 The apostolate became his full-time focus in 1988, and today has a several staff apologists and speakers, a national radio show, and a publishing office. Keating has written several books, including the best-selling Catholicism and Fundamentalism and What Catholics Really Believe. 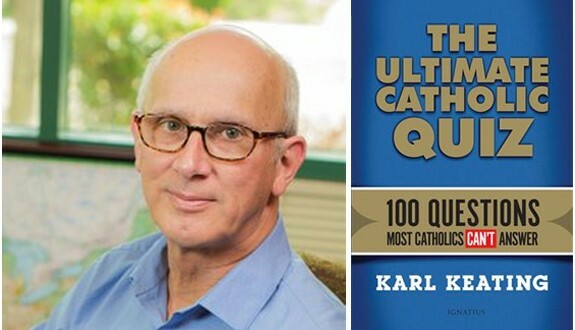 Last year he spoke with CWR about his book The New Geocentrists, and he recently corresponded with CWR about his just-published book The Ultimate Catholic Quiz: 100 Questions Most Catholics Can’t Answer (Ignatius Press, 2016). CWR: How did you go about selecting these 100 questions? Are most of them questions that you’ve been asked over the years? Karl Keating: Only some of them are questions I actually fielded at parish seminars, on the radio, or online. Even then, those questions have been recast, chiefly so the correct answer will be harder to find. Most of the questions, though, never were put to me as questions per se but arose out of discussions of doctrinal, moral, or historical points. I discovered early on how often even well-educated Catholics get a point almost, but not quite, right. Sometimes, the “not quite” is immaterial, but sometimes it can be the difference between a missal and a missile. CWR: Is this book actually a sort of mini-catechism in disguise? Keating: You put me in a bind. I’ll answer “no,” because if I had fashioned a disguise that you were able to see through so easily, that would speak to my lack of skill at subterfuge. I do hope The Ultimate Catholic Quiz will lead readers to engage in self-catechesis—that is, I hope they’ll be intrigued enough by the Catholic faith (and challenged enough by my questions) that they’ll start reading up on their own. Of course, I won’t object if they choose to begin with my other books. CWR: You’ve been active in Catholic apologetics for almost four decades now. What are some of the most difficult questions you’ve been asked? Strangest questions? Keating: The most difficult questions have come from people who want to know what they can do to bring wayward family members back to the Church. In most cases I can give no satisfactory answer because it seems to be a rule of human nature that there is little that’s more difficult than helping loved ones to see that they’ve erred. There’s too much pride involved, I suppose, and often on both sides. I remember once giving a parish talk on the Jehovah’s Witnesses. During the question-and-answer period a middle-aged woman approached the microphone. I could see the glisten of tears on her cheeks. I knew what she was going to say: that her child had left the Catholic Church and joined the JWs. Instead, she said, “I just found out that my parents have become Jehovah’s Witnesses.” I could empathize with her but could offer no sure-fire way to bring her parents back. That, I told her, would have to be done by a third party, someone not involved in family discussions and disputes. As for the strangest question I ever received, it came up at a debate against a one-time priest who headed an anti-Catholic fundamentalist ministry. A woman in the audience said, “My mother lives in Mexico. Under her bed she keeps a jar with a hairball in it, and she worships the hairball. Why does your church teach her to do that?” That was a real question, and I had to make it clear that the Catholic Church teaches no such thing and that hairballs are nowhere mentioned in the Catechism of the Catholic Church or in any other Church document. CWR: What have been the issues most often raised by Catholics during your Q&A sessions or on radio broadcasts? Keating: The most commonly addressed issues are liturgical and marital. People want to know what is and is not permitted at Mass. As you might suspect, if they have to ask, then, when they’re told that their favorite activity isn’t permitted by the rubrics, they become annoyed. (People who know what to do at Mass never have to ask.) With respect to marriage, the most common questions are about annulments and remarriages. It seems that we’re back in the early Middle Ages, when marriages (or putative marriages) were a mess. People seem to be as badly catechized now about matrimony as they apparently were then. CWR: In your experience, what are the topics most often misunderstood by Catholics? How about by fundamentalists and atheists? Keating: Catholics—I mean the bulk of them, especially those who don’t show up on Sundays but also many who do—have difficulty in explaining what the Mass is and why they ought to attend, at least beyond mere habit or family expectations. Most of them have a deficient sense of sin. I sometimes quip that the only Marian doctrine no longer doubted is the Immaculate Conception, because nowadays everyone thinks we all have been immaculately conceived. Thus, people don’t sin—they just makes mistakes. As for fundamentalists, their greatest deficiency is not so much doctrinal but historical. They have little sense of the Church as an institution that has lived through 20 centuries. They act as though it has been around only six centuries or so, with a giant interregnum from AD 100 to 1517—at least this is how they tend to work in practice. This means they get nearly everything wrong about what the Church itself is and how it’s supposed to operate, and that in turn means they have no sense of a magisterium and are reduced to private interpretation, not just of the Bible but of the whole of Christian existence. CWR: How has Catholic apologetics changed since the late 1970s? What are some of most pressing challenges for Catholic apologists today? Keating: When I began working in apologetics—my first overt apologetical act occurred in 1979—my focus was on the fundamentalist challenge because, from the 1970s and into the 1990s, a big problem was the exodus of Catholics. Each year, roughly 100,000 Catholics in America left the Church of their upbringing and joined a “Bible believing church.” I’m pleased to say that this problem largely has been resolved. The traffic used to be one way, but now most of the traffic is in the other direction. You still hear about people leaving for fundamentalism, but it’s not nearly as common as it once was. I like to think that the modern apologetics movement can be given some credit for this turnaround. Today the greatest challenge among Catholics and among many others is indifference. It’s not so much disbelief—it’s not as though the New Atheists are making converts, so to speak—but a lack of interest in religious matters. The default position is: “Okay, I’ll accept that God exists, but so what? Why should that fact (if it is a fact) influence how I live?” It’s hard to argue a question with a person who has no interest in it. CWR: If you had been given a copy of your book 40 years ago, how would you have done? Keating: I’d have been smart enough not to tell anyone my score. If I had scored low, I would have felt ashamed. If I had scored high and said so, I’d be accused of bragging. It would have been like trying to guess a woman’s age: don’t even try, because you just can’t win.